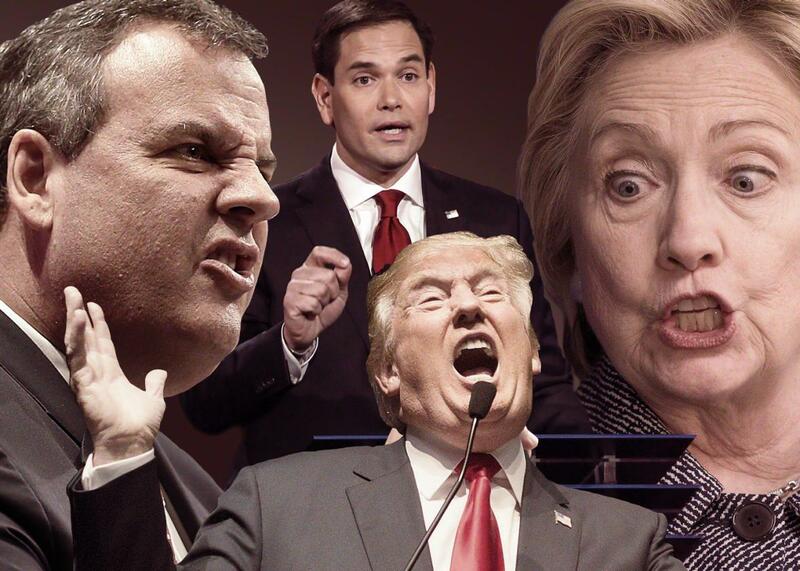 The five worst things presidential candidates said about money in 2015. From Donald Trump’s “small loan” of $1 million to Hillary Clinton’s patriotic contributions from Wall Street. Chris Christie, Marco Rubio, Donald Trump, and Hillary Clinton committed some of the worst offenses this year. Photo illustration by Slate. Photos by Scott Olson/Getty Images, Joe Raedle/Getty Images, and Justin Sullivan/Getty Images. It’s often said that we reveal ourselves every time we discuss and handle money. Are we generous? Parsimonious? Greedy? Do we exaggerate the truth? Are we careless? Do we rationalize our own actions? Look to the personal ledger, and all will be uncovered. Our presidential candidates bolster this notion. True, we can’t look at their actual personal finances, not closely. No one is handing over a checkbook or publishing day-to-day personal expenses. Instead, we mostly hear what they say about money. The results can be telling. Sometimes, we get a pleasant surprise. Donald Trump, in between insulting women, Muslims, and undocumented immigrants, also linked the United States’ crumbling infrastructure to our nation’s endless military engagement in the Middle East in a bottom-line, easy-to-understand way. “If we could have spent that $4 trillion in the United States to fix our roads, our bridges, and all of the other problems, our airports and all of the other problems we have, we would have been a lot better off,” he said during the most recent Republican debate. Others demonstrate a way with a gesture. When bad-boy pharmaceutical CEO Martin Shkreli donated $2,700 to Bernie Sanders’ campaign for president, the Sanders campaign didn’t simply return the money. Instead, it donated the sum to a Washington, D.C., health clinic specializing in treating AIDS. Shkreli famously raised the price of a drug used to treat an AIDS-related infection by more than 5,000 percent. But in their talk of money, the candidates have also exhibited plenty of pettiness, self-righteousness, and in some cases outright sleaze. Here are the five worst offenses from 2015. Many of the candidates have pushed the graying idea that Social Security somehow needs to be saved from the people who receive it and that the way to do it is by cutting back on benefits. Until recently, it was a reliable trope for both Democrats and Republicans. It was only in his second term, after all, that President Obama stopped pushing to change the formula for calculating the annual increase in benefits. But in this presidential cycle, trash-talking the program that’s keeping a majority of the elderly out of poverty is a purely GOP game. Ben Carson claims Social Security will “run out of money” in 2033. As for Marco Rubio, there’s one Social Security beneficiary he’ s interested in: his mom. “My mother’s on Medicare and Social Security. I’m against anything that’s bad for my mom,” he said during the third Republican debate. But if you’re younger than 55? Pffffft. Rubio wants to raise the full retirement age. But no one has stooped to the level of Chris Christie, who tells anyone who will listen that Social Security is in immediate danger. “Harvard and Dartmouth say Social Security will go insolvent in seven to eight years,” he said during the Sept. 16 Republican debate. As for the study Christie mentioned during the debate? It’s the work of three academics affiliated with Harvard and Dartmouth who claim the Social Security Administration is using a flawed statistical model to estimate the financial health of the program. Others, including the Social Security Administration and any number of left-leaning economists, disagree with that analysis. Even if it’s true, the fix is a less-than-scary $60 annually for a worker earning an average salary in 2022. We can view Chris Christie’s take on Social Security as a microcosm of his less-than-empathetic traits. Not only is his black-and-white worldview on display, so too is his well-documented tendency to bully and demonize average voters who just happen to disagree with him. While chatting with Matt Lauer in October at a New Hampshire town hall event, sponsored by Today, Donald Trump credited his beginnings to “a small loan” of $1 million from Dad. “It has not been easy for me,” he told Matt Lauer. After all, not only did Dad expect the young Donald to pay the money back; he expected interest, too. Denying the advantages of his 1 percenter background is a repeated pattern for the Donald. Remember his now-defunct Trump University? “Just copy exactly what I’ve done and get rich,” promos for the wealth seminar declared. No, students didn’t find out how to pick a multimillionaire real estate developer for a father. Instead, in exchange for $1,500 to $35,000, they learned such secrets as convincing credit card issuers to raise credit limits by counting “projected income” as surefire earnings. There’s a word for this sort of stuff, and it’s been used by of Trump U’s many disgruntled students. “A bunch of frauds,” proclaimed Nora Hann, of Brooklyn, in the New York Daily News. There’s nothing wrong with being to the manor born. There’s something wrong with refusing to acknowledge the benefits it brings. We all understand that when politicians run for office, they need to ask for campaign donations. Many donors will be wealthy. It’s likely their giving will come with a motivation. They might, in fact, want something in return for their generosity. This self-evident truth has led to no small amount of cynicism about Hillary Clinton’s intentions toward Wall Street. Yes, she has a reform plan. But the financial sector has given millions of dollars to Clinton’s many campaigns over the years. Would bankers really give her money if they thought she would damage their long-term financial health? There are a number of ways a candidate can answer this question. He or she could talk about personal integrity, and claim to be insulted. Or maybe talk about the trade-offs the United States’ campaign-finance system forces candidates to make. A candidate could even defend the unsavory organizations whose money he or she is taking. What one should not do is what Hillary Clinton did. During the November Democratic presidential debate, rival candidate Bernie Sanders and moderator (and Slate columnist) John Dickerson pushed Clinton to explain how she could adequately regulate the financial industry while also asking it for campaign handouts. Instead of answering the question, Clinton pointed out that Wall Street is located in lower Manhattan, lower Manhattan was the site of the 9/11 attack, and—and this is worth quoting at length—“I did spend a whole lot of time and effort helping them rebuild. That was good for New York. It was good for the economy, and it was a way to rebuke the terrorists who had attacked our country.” The Internet—or at least those parts that had nothing better to do on a Saturday night—all but barfed. Twitter lit up, so much so CBS highlighted one writer who claimed “I’ve never seen a candidate invoke 9/11 to justify millions of Wall Street donations until now.” Clinton back-pedaled furiously, but mainly succeeded in reminding almost everyone of her ham-handed inability to convince others of her own rectitude. She is, after all, the same person who rationalized her family’s post-presidential payday by claiming in a 2014 interview they were “dead broke” at the end of the Bill Clinton’s time in office. Pity Jeb Bush. He no doubt thought he would score beaucoup political points last winter when his campaign released 250,000 emails sent to and from his personal account while he was governor of Florida. We all know which candidate did not release her emails in one large batch, after all—a comparison Bush would later hint at. Unfortunately, Bush was so dedicated to openness that the trove included not only the email and home addresses of many correspondents, but the Social Security numbers of about 13,000 constituents. There were birth dates, too. This was everything an enterprising identify thief on the make needs to get a start. The Bush campaign blamed the state of Florida for not vetting the information properly and quickly took the offending info down, but it was probably too late. You can’t reverse carelessness. The state of Florida, at least, stepped up and offered to pay for a year of LifeLock, a company that offers identify theft monitoring and protection, for anyone whose Social Security number was exposed. The contretemps revealed something about Jeb Bush’s campaign for president that would only become fully clear as the year went on: His pitch for the job is less about why he wants the position than what’s wrong with the others seeking the voters’ nod. Predictably, it never goes well. He’s gone after Marco Rubio for his absences from congressional votes. That backfired when Rubio pointedly asked why Bush didn’t critique John McCain for the same thing. Bush is now attacking Donald Trump for being a “jerk” and a “chaos candidate.” He’s not wrong, but it doesn’t matter. Perhaps if he spent less time trying to show up other candidates and more time articulating a reason why voters should consider voting for him, he might pick up more support. Then again—this being the Jeb we’ve all come to know and shrug at—maybe not. Marco Rubio’s financial misadventures could populate their own Top 5 list. There’s his mingling of personal and business expenses on a Republican Party–issued credit card. There was the purchase of not one but two homes with zero-money-down loans. There’s the ongoing mystery of how, precisely, Rubio compensated Mark Salter to help him write An American Son, with some speculating that a payment by Rubio’s political action committee to the renowned ghost writer might have run afoul of Senate ethics rules. Then there’s the silly stuff. Did Rubio really need to buy an $80,000 fishing boat with his $800,000 book advance? The issue isn’t Rubio’s extravagance or inability to keep his wallet closed. If a taste for luxury and nice real estate outside of one’s budget renders one unfit for public office, we’d have to disqualify everyone from Thomas Jefferson, who spent way too much money on everything from home décor to French wines, to Winston Churchill, whose chronic inability to live on anything resembling a budget was so pronounced, that it’s the subject of the recently published book No More Champagne: Churchill and His Money. The issue is the discrepancy between what Rubio expects of everyone else and what he believes applies to him. In his view, banks that gave out mortgages to, uh, people like Rubio didn’t cause the financial crisis. Instead it was “reckless government policies.” While he can’t keep his own financial house in order, he expects Washington to do just that. The federal government has “an addiction to irresponsible spending,” his website declares. If a relative displayed this extreme lack of self-awareness, it would be comic. But in a candidate for the presidency, it’s disturbing.